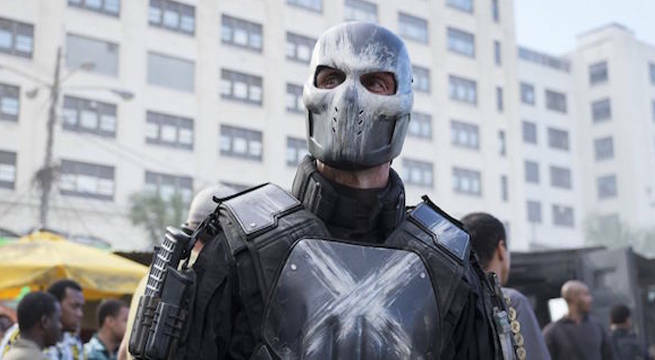 For those of you who think Crossbones bit it in Captain America: Civil War, it might be time to think again. In a recent interview, actor Frank Grillo teased fans by questioning whether or not his character was really dead. Introduced to the MCU through Captain America: Winter Soldier, the mercenary made his return in Civil War during an epic showdown with the Avengers. Crossbones finds himself fighting one-on-one with Captain America himself, and after the villain manages to distract Cap with a well-timed reference to Bucky Barnes, Crossbones then proceeds to detonate a suicide belt to take the hero out. However, Scarlet Witch barely manages to contain the explosion with Crossbones seemingly still at the center of it before she whisks him away. It's not hard to believe Crossbones didn't make it out of that fiery situation. Perhaps the actor has a point. After all, when it comes to comic books, many characters have a long history of dying, reviving, dying again, and then miaculoudly making their way back to their respective universes. And, when it comes to Marvel, it seems like only Spiderman’s Uncle Ben has managed to die and, well, stay dead. For heroes and villains, it’s best to assume no one is dead unless you’ve seen their body - and even then - those remains definitely worthy of skepticism. That's not to mention Crossbones has managed to survive deadly situations before. Fans got to see this firsthand in Winter Soldier when Brock Rumlow somehow lived through The Triskelion collapsing on top of him. Sure, he did come out scarred and thirsty for revenge, but he had to be alive to do so. Like most actors in the MCU, Grillo has signed a contract for multiple movies, but it's up to Marvel Studios to decide whether Crossbones will feature in future films. However, if Grillo is right about Crossbone’s alleged ‘death,’ fans shouldn't be too surprised to see the villain causing more trouble for the Avengers soon.